Iran in the latter half of the 18th century lived under the shadow of Nader Shah (and in some respects still does to this day). He was born Nader Qoli on October 22, 1688, a member of Turkic Afshar tribe. 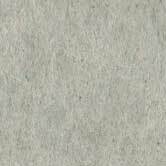 He rose to become a beg � lord or chieftain � of the Afshars, as well as one of the empire�s most skilled generals under the reign of the last of the Safavid shahs. Nader Shah, by David Meyler. the ruling Shah Sultan Husayn and had himself made emperor. This was one of the lowest points in the long history of Iran. His reign did not last, however, and in 1725 Mahmoud was assassinated by his own men, and a cousin, Ashraf, was crowned, marrying a Safavid princess in an attempt to give himself some legitimacy. 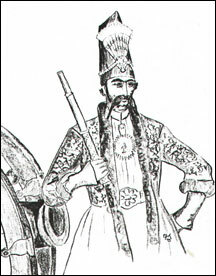 Nader Qoli Beg initially served with the Afghans in a campaign against the Ozbegs, but when Ashraf withheld his promised payment, he joined a revolt in 1727 with 5,000 men, in support of the Safavid heir, Tamasp II. Nader defeated the Afghans and drove them out of Khorasan. Ashraf attempted to flee, after massacring 3,000 Persians in Isfahan, but was hunted down and killed. While Nader was busy in the east, Tamasp II invaded Ottoman Turkey to build up a military reputation for himself. By 1732, the shah had managed to lose Armenia and Georgia to the Turks. Nader was enraged and had the shah deposed, and replaced by Tamasp�s infant son, under the name Shah Abbas III. This clearly showed who the real power was. Immediately, Nader struck back at the Ottomans and regained all the territory lost by Tamasp. Abbas died, apparently of natural causes, in 1736, and Nader, dropping all pretense, had himself crowned shah. In 1738, Nader Shah launched what is likely his greatest military campaign. He invaded Afghanistan through Kandahar and captured Kabul and later Bukhara. Nader then hit Moghul India, captured and sacked Delhi, and slaughtered 30,000 of its citizens. He returned to Iran with much of the Moghul treasure horde, including the famed Peacock Throne and the Koh-i Noor diamond. Nader then, in 1743, resumed the war against Turkey scoring more victories, and picking up some territory at the expense of the Russian Empire. He also built a fleet in the Persian Gulf and conquered Oman. Nader�s domestic policy was one of increasing paranoia and cruelty. Tamasp II and his two surviving sons were murdered in 1740. Nader had his own son blinded and executed many Persian nobles out of largely imaginary fears of insurrection. He also made a failed attempt to make Sunni Islam the state religion, alienating many of his Shia supporters. Finally, in 1747, while on campaign in Kurdistan, a group of his own officers attempted to assassinate him at dawn. �Better we make breakfast of him before he makes supper of us,� was their credo. The 61-year-old shah, while caught by surprise, managed to kill two of his attackers before he was overcome and killed. Sometimes called the Second Alexander, the Napoleon of Iran or the last of the great Asian conquerors, Nader had expanded Iran�s boundaries to their greatest extent since the Sassanids in early medieval times. But it was not to last. Succeeded by Adil Shah, his nephew, the new emperor promptly had all of Nader�s sons and grandsons executed, save one, the 14-year-old Rukh. Adil was soon deposed by his brother, who was them deposed and murdered by his own troops. Adil was also eliminated at this time. Rukh was then made shah, deposed and blinded, then reinstated, deposed and reinstated once again. In short, the empire fell into anarchy, with each of the various provincial governors ruling their own petty kingdoms. Only in the south was the warlord Karim Khan, 1753-1779, able to maintain a core territory, what is historically termed the Zand dynasty. Upon the death of Karim, Agha Mohammad Khan, a leader of the Turkic Qajar tribe from Azerbaijan, began an attempt to reunite the empire. At the age of six Mohammad had been castrated on the orders of Adil Shah to prevent him from becoming a political rival � it didn�t work and it did not prevent Mohammad Khan from establishing a dynasty. He had been held captive for 16 years in Shiraz but managed to finally escape in 1779. In a long series of campaigns, Mohammad Khan overcame all his rivals. The last of Zand dynasty, Lotf�Ali Khan, was defeated in 1794. He established the new capital at Tehran, then a small provincial town of 15,000. In 1796 Agha Mohammad led a successful expedition against the Christian Kingdom of Georgia, which was then reincorporated into Iran (raising Russian ire). He conquered Khorasan, the last centre of resistance to his authority; there the ruler Shah Rukh (the blind, non-dancing grandson of Nader Shah) was tortured to death. Mohammad Khan was formally crowned shah in 1796, but he did not long enjoy his hard won victory. The following year, he was assassinated and was succeeded by his nephew Fath Ali Shah. Iranian weapons by David Meyler. Fath Ali ruled to 1834 and finally reestablished a degree of stability. With the aid of the able Mirza Assadolah Khan, Minister of War and the Crown Prince Abbas (or Abbas Mirza, mirza means prince � that�s the leader counter Abbas M. in Soldier Emperor), a new army based on the Napoleonic model was created. Pressure from Russia advancing into the Caucasus led to the first Russo-Persian War (1806-1813). The Russian forces generally prevailed thanks to superior artillery. Still, Abbas Mirza, using the terrain and superior tactics, managed to win a number of victories to stave off total defeat. The Treaty of Golestan, however, confirmed the earlier Russian annexation of the kingdom of Georgia, as well seeing the loss of parts of the northern Caucasus. The nation began to open itself up more to European influence, and while Abbas Mirza sent Iranians abroad to study European technology, British advisors were brought into the country to further reform the army (followed by the French and Austrians in later decades). The Ottomans were stunned by the performance of the new Iranian army at the battle of Ezeroum in 1821, which confirmed the existing boundaries between the two empires. Fath Ali Shah, however, then overstepped himself, leading to the second Russo-Persian War 1826-28. While the Iranian army under Abbas Mirza had proved itself a dominant regional force, it was still no match for a major power like Russia, which was able to field a much larger and better-equipped army. At the Treaty of Turkomanchai, Iran ceded much of its northern territories, the entire area north of the Aras River (comprising present-day Armenia and the Republic of Azerbaijan), and had to pay Moscow a huge war indemnity. Fath Ali died in 1834 and was succeeded by his grandson Mohammad Shah. He attempted twice without success to recapture Herat, an ancient province of the Iranian empire, but long since part of Afghanistan. Here, Iran was dangerously getting drawn into the �Great Game.� Mohammad Shah was pro-Russian, and while the Afghan forces on their own were no match for the Iranian army, the Afghans had British backing (at least, while fighting the Persians). Mohammad Shah died in 1848, with his son Naser-ed-Din, taking the throne. He ruled for most of the remainder of the century. 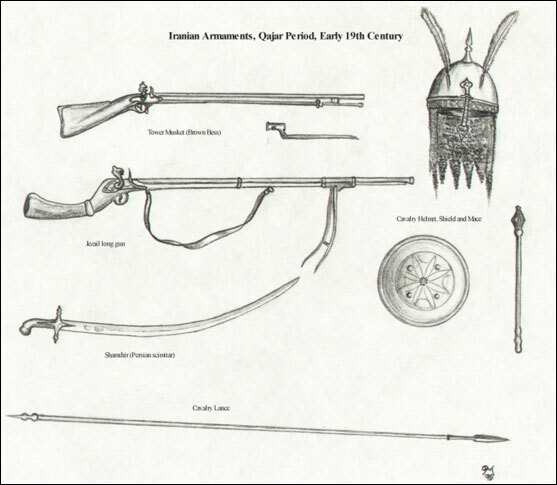 Iranian designs on Herat did not end, leading to an all-out war with British India in 1856-57. There was one battle of note, the Battle of Khosab on February 8, 1856. The British won a clear tactical victory using a large square formation to beat off the Iranian cavalry. But the fighting was not as one-sided as one is led to believe from British sources, and while the British had better firearms and artillery, there were gross administrative and supply deficiencies (as was also seen in the Crimean War) that forced a British retreat. Still, the defeats against Russia and Britain proved demoralizing, and Iran, while undergoing something of a cultural revival under Qajar rule, increasingly fell under the sphere of influence of its two powerful neighbours. In the political chaos following the assassination of the aging shah in 1896, Iran became a virtual colony of the Europeans, divided into a Russian and a British sphere of interest. It would not be until the 1920s, following the double cataclysms of the First World War and Russian Revolutions, before the country again gained a measure of independence. Soldier Raj and Soldier Emperor already have provisions for linking their maps. This variant adds an overland option when playing linked scenarios. The area missing between the two maps was not great, so I made a small map overlay to add eastern Persia. While not entirely to scale, it serves as a link between the two maps. The rules for inter-map movement remain unchanged, but units can also now move overland (this opens another option to intervene in Central Asia, especially for Russia). Khorasan (Fortifications 2, Money 1, Manpower 1), with a mountain route connecting to Baku, a land route to Azerbaijan and mountain route to Fars. Khorasan also connects to the Soldier Raj map with a mountain route to Afghanistan. Fars (Fortification 2, Money 1, Manpower 2), with a mountain connection to Azerbaijan, a mountain connection to Khorasan and a land route to Baluchistan. Baluchistan (Fortification 2, Money 1, Manpower 1), with a land route to Fars. Bauchistan also connects to the Soldier Raj map with a land route to Baroda. The map overlay joins the southeast portion of the Soldier Emperor map with the northwest frontier of Soldier Raj. Persian forces remain unchanged.